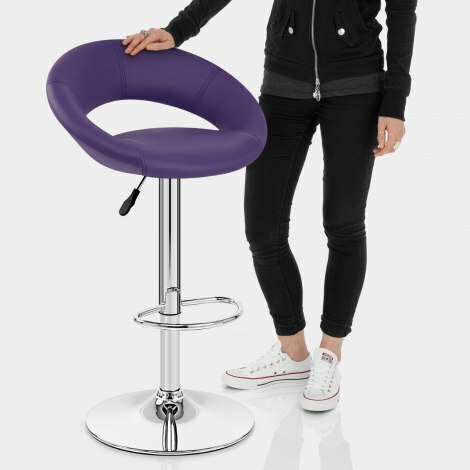 The fabulous Padded Crescent Bar Stool Purple is a funky blend of the retro and contemporary, a design that will work well in either setting with its purple faux leather and wide, arched backrest. A modern classic with a vibrant finish, the Padded Crescent will always impress. This backrest surrounds the seat, both padded for high levels of comfort, and gives added security, supporting your lower back. The purple faux leather will brighten any room with its bold aesthetic. The seat is affixed to a chrome plated central stem, on which is the hand fashioned footrest, adding to the desirability of this stool. 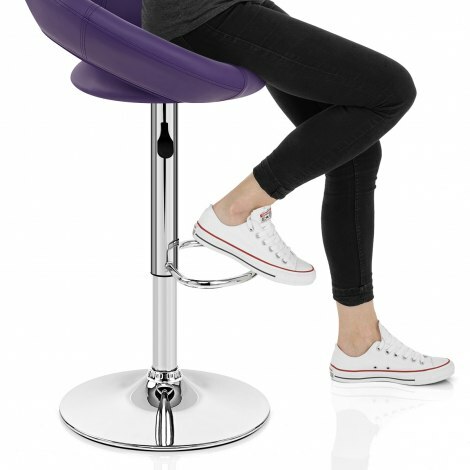 A gas lift mechanism gives you the option of raising or lowering the stool as well as allowing you to turn through 360 degrees, making access to a bar table all the easier. To finish off the package, the circular base keeps the Padded Crescent superbly stable and also comes with a rubber floor protector beneath. "We are so pleased with this stool, great colour"
Excellent, love the colour! Easy to put together. Excellent value for money really comfortable stool. The company were excellent to deal with would recommend them to anyone. Delighted with quality and price. Arrived promptly. Good communication. We are very pleased with our purchase, and service was wonderful. Had a slight issue which was sorted exceptionally promptly by the company. Cannot be faulted. Very efficient ordered Sunday afternoon arrived Monday morning. Perfect in my kitchen.